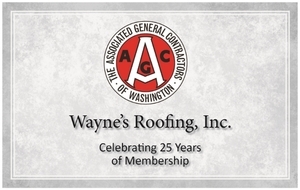 The Associated General Contractors of Washington awards Wayne's Roofing with the lowest EMR& Top 3 Lowest EMR of .55 for maintaining a 14 year average of .69. Wayne's Roofing Inc. received a celebratory award from the AGC in recognition for 25 years as a member. 2002 Family Business of the Year! Top 20 Roofing Contractor's of the Year!